By happy coincidence I visited Paris for the first time a few months later and spent a day in nearby Giverny at the estate of Claude Monet, the great impressionist painter. As I saw the ravishing flowers, peaceful water gardens, and charming village, it became clear that the inspiration for the piccolo sonatina was falling into place. Sonatine de Giverny captures my experience seeing what Monet saw and is a musical setting of Giverny in our lifetime, not of Monet's paintings. The Giverny estate is carefully preserved to look just as it did 100 years ago, so there is a fascinating and almost eerie blend of old and new. Les fleurs ravissantes depicts the brilliant ravishing flowers in the upper garden near Monet's house, with bright poppies and other plants interrupted by countless colorful butterflies and tiny flowers creating a ripply visual texture which certainly influenced Monet's work. Les jardins d'eaux reflects the profound calm at the lower water garden which Monet created, with the famous Japanese footbridges, weeping willows, and water lilies. The photos on the cover of the publication were taken by me in 1999, but they appear timeless. En ville leaves Monet's estate to capture the bubbling charm of the rural towns of Giverny and Vernon. 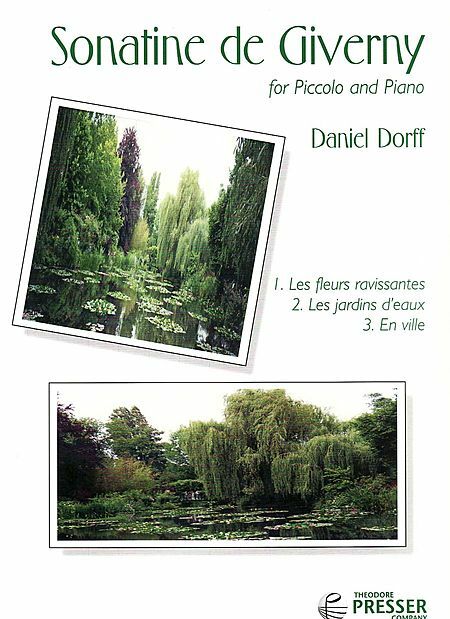 "Daniel Dorff's Sonatine de Giverny is the first composition for piccolo and piano in the great tradition of the French School of Ravel, Gaubert, and Roussel. Giverny requires the piccoloist to perform with a beautiful, shimmering sound and an assortment of vibratos; a big, rich low register, and a third-octave transparency created through the mastery of controlled fortissimo. All the French attributes of clarity and subtle dynamics are now being asked of the piccolo, and Giverny will become the landmark composition for expressive French piccolo playing. We are grateful for Dorff's fine effort. Giverny now becomes a musical standard which other composers must attain." T12 | 123, and then trill the LH2 and RH1 together. AUDIO EXCERPTS (and several CD covers) are provided on the Flute page of this website.